This article is for my black brother, a community leader and little league football coach who gets his news solely from the liberal mainstream media. Hopefully it will help him to understand why I, his big brother, is working with those white tea party people against his beloved black president. This article is also for my black relatives who gave me a chilly reception at my grandmother's 100th birthday party. I learned through the family grapevine they resent my involvement in the tea party and consider me an embarrassment to the family. Well, I say to my embarrassed relatives, blame my instincts on the mentoring and leadership of my dad. My dad has been a Christian man of character and honor all of my life. So, when I see a characterless liberal political hack occupying my beloved country's Oval Office, I refuse to join the flock of black sheep worshiping him because we share the same skin color. To my relatives who have thrown their Christian values, principles and brains out of the window to give their black idol a pass, you guys are the ones who should be ashamed of yourselves. Marcus family tradition has drilled into us that it means something to be a Marcus; an adherence to a higher standard. YOUR SELLOUT TO SKIN COLOR EMBARRASSES ME! If you detect a bit of anger, you are correct. In the 60's, most blacks did not march or protest in the streets, but fought for freedom in their own private ways; entrepreneurship, prayer, striving for excellence and etc. A black buddy of mine who went from being incarcerated as a teenager to becoming an art director in a prominent advertising agency attributes his success to a black high school art teacher, Lindy Jordan. Mr. Jordan mentored so many black youths, a scholarship was founded in his honor. Mr. Jordan was never seen in the streets protesting for civil rights. I submit that Mr. Jordan fought for black liberation and equality in the best way he knew how to fight; by mentoring black youths. But, leave it to this probably former hippie spoiled brat white boy, O'Donnell, to think all blacks who did not march in the streets must have been Uncle Toms. O'Donnell's liberal arrogance is off the chain. In my opinion Lawrence O'Donnell owes Mr. Jordan and other black American civil rights pioneers an apology. O'Donnell is yet another white racist arrogant liberal attempting to dictate what is and is not acceptable black behavior. White liberal actress Janeane Garofalo displayed the same racist arrogance when she proclaimed black Republicans Michael Steele and Herman Cain to be suffering from Stockholm Syndrome. LISTEN UP, O'Donnell, Garofalo and all you other pompous liberal plantation slave massas. By the Grace of God, we black Americans are FREE; free to be successful entrepreneurs such as Herman Cain and countless other blacks rather than government dependent welfare recipients. We blacks are free to live outside of your liberal stereotypical dictates. I prefer sushi over fried chicken. Does that make me "less" black? Probably yes, in the minds of arrogant liberal racists. How dare white liberals appoint themselves authorized to dictate what is and is not authentic black behavior. O'Donnell followed up his program in which he spanked Cain for not being black enough with analysis from liberal plantation black overseer, Rev. Al Sharpton. As expected, Sharpton further trashed Cain. Based on Sharpton's betrayal of black America and his racially divisive and evil Tawana Brawley scandal, Al Sharpton is not even worthy to shine Herman Cain's shoes. And yet, this is the guy the left has appointed "spokesperson" for black America; again confirming their arrogance. Herman Cain's story is one of inspiration, courage and honor which epitomizes the American Dream. If these paragons of tolerance and compassion on the left such as O'Donnell and Sharpton truly gave a d — about black America, they would herald Herman Cain as a hero. They would celebrate Cain as a shining example for black youths, illustrating the limitless success which can be achieved via education, hard work and character. Sadly, inspiring black youths to pursue their dreams is NOT the intention of O'Donnell, Sharpton and the left. Their intention is to create another generation of Americans dependent on big government for survival. With Obama leading the campaign, they seek to create dumbed down Democrat voters who view themselves as victims and hate everything which has made America great; including capitalism and individual freedom. 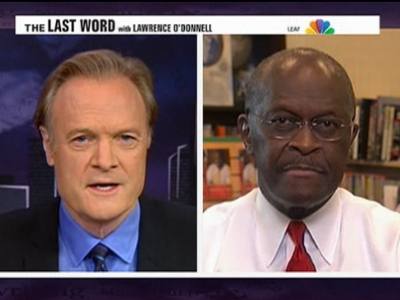 O'Donnell's question to Cain about his lack of involvement is the 1960's civil rights movement was to portray him as an Uncle Tom. It was despicable. So, every time I hear these creeps on the left pontificate about their compassion for blacks, it turns my stomach. The left views and values blacks only as pawns in their quest to portray America as the greatest source of evil in the world. The left deems happy America loving blacks who have achieved success via traditional routes such as education and hard work to be "paradigm breakers" and MUST be destroyed. So, please forgive my lack of respect for my white "would be" liberal slave massas and their traitorous black overseers. These people are evil and must be defeated.